The Tories have enjoyed election success across Berkshire, sweeping to power in Windsor and Maidenhead and weakening Labour's hold in Reading. 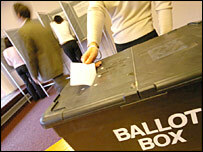 The party picked up 18 seats from the Lib Dems in the Royal Borough of Windsor and Maidenhead to take control. In Reading, Labour - the controlling party - lost seven seats, six of which went to the Tories. The Conservatives enjoyed a big swing in West Berkshire gaining nine seats while the Lib Dems lost eight. The Tories also strengthened their hold in Wokingham and on Bracknell Forest Council. In the latter, they picked up six extra seats bringing their number to 39. In Wokingham, they picked up two seats from the Lib Dems, and Labour was still left with no presence on the council. Labour's faint hope occurred in Slough where they gained one seat from the Lib Dems to take them to 19 councillors. But with the Tories retaining seven seats there is still no overall control. Friday's count in Reading Borough Council saw the Lib Dems poach one seat off Labour.